Skystream is initially available primarily for North American grid configuration (220V/60HZ). Additional international configurations (50HZ) will be available in late 2006, along with marine and battery charging versions. The Skystream 3.7™ is a new generation residential wind generator that hooks up to your your home to reduce or eliminate your monthly electrical bill. It's the first all-inclusive wind generator (with controls and inverter built in) designed to provide quiet, clean electricity in very low winds. This makes Skystream ideal for residential homes and small businesses. A residential wind generator from Southwest Windpower,the Skystream 3.7, is a fully integrated wind generator designed specifically for the grid-connected residential market. The turbine incorporates a combination of new technologies, developed in collaboration with the U.S. Department of Energy's National Renewable Energy Laboratory (NREL). According to Michael Elliot, Director of Sales for Latin America and Africa at Southwest Windpower, the unit has a peak working-coefficient-of-power (Cp) rating of approximately 0.4 (40%), while the theoretical maximum of an ideal wind turbine would be 0.59 (59%). The Cp rating is the energy-harvesting efficiency of a wind turbine. With no batteries, the Skystream 3.7 connects directly to the home's electrical system to supply power. When the wind is not blowing, the home is powered by the electric utility. Depending on the local utility, excess electricity generated by the turbine can be sold back to the utility or used at a later date. The design uses a 3-phase slotless permanent-magnet (PM) brushless alternator. The ac power from the alternator is rectified and fed to a UL 1741-compliant inverter. Paul Thomas, Electrical Design Engineer at Southwest, stated the resulting dc input voltage can range from 60 Vdc to 360 Vdc, and the inverter's split-phase output is 240 Vac at 60 Hz for U.S. grid-tie compatibility. However, the inverter is capable of providing an output voltage from 120 Vac to 250 Vac at 50 Hz to 60 Hz. The inverter was independently designed for Southwest by Ed Hall. It is housed within the nacelle of the turbine. Elliot stated that this is the first inverter optimized for widely varying inputs, which are characteristic of the energy profile of wind energy. This is accomplished through a fast-responding control algorithm, making it different from solar inverters, which receive power that changes on a much slower time scale. 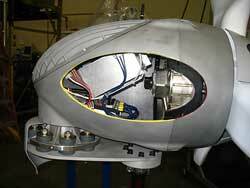 The SkyStream 3.7 integrates a specially designed inverter within the nacelle of the turbine. The Skystream consumes 5 W, supplied by the home's electrical system, to power the control electronics. As part of UL 1741, the inverter is required to fail open in the absence of power on the grid. The turbine is equipped with a 2-way wireless control link that provides data for gridline voltage, RPM, and output power. The latter function can be monitored by a PC to maintain a running total of energy production. Within the next six months, Southwest will deploy the capability for these turbines to provide data logging of system parameters directly to the internet, eliminating the need for a standby computer. See if Skystream is right for your site.